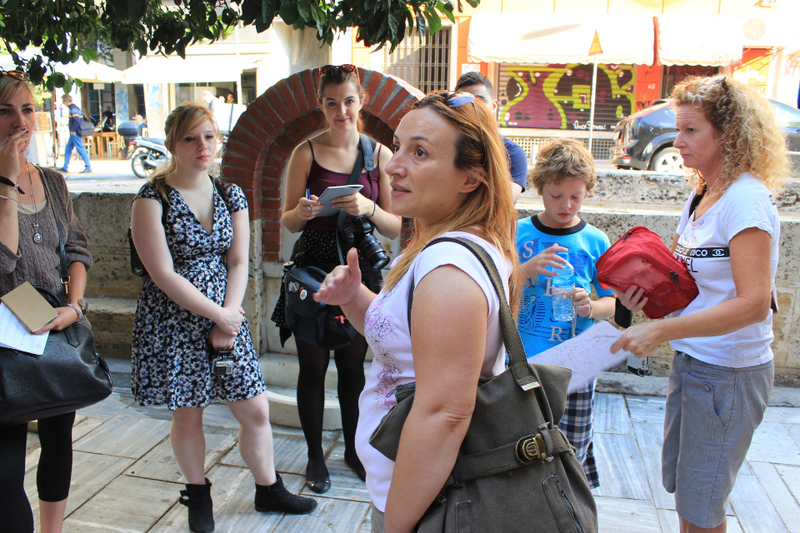 This half-day walking food tour around the Psiri neighbourhood (north west of better known Plaka) was offered by Athens Walking Tours and led by our very knowledgeable guide Vassiliki (Vicky for short). Vicky talked not only about the food, but also how it tied into the culture and religion of the country. 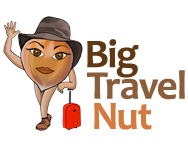 “Athens is like a big village” she said, and she explained that because most inhabitants of Athens come from small villages on the islands or mountains, meal times are determined by the habits of these primarily agricultural regions. For example, rising early and getting most of the hard work done before the heat of mid-day gave rise to the late lunch hour (2:00 to 4:00 PM) followed by a siesta before resuming work later in the day. 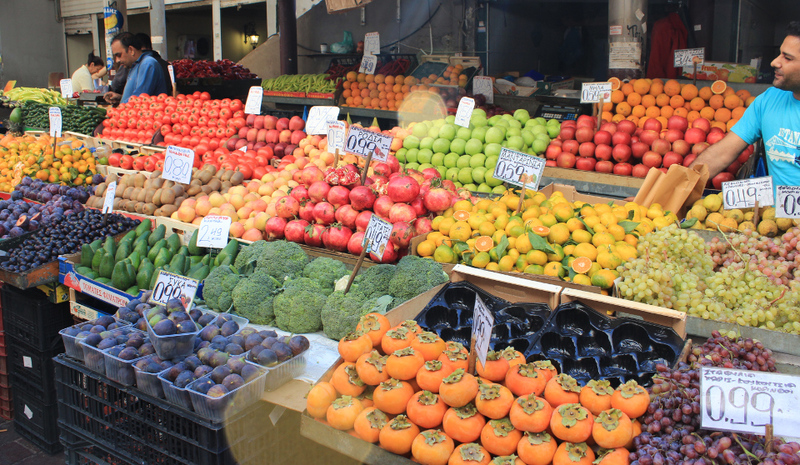 As well, due to the many fasting periods of the Orthodox Christian calendar (97% of Greeks are Orthodox ) when people essentially become vegan for several weeks, many foods have been adapted to these stricter eating habits and provide proteins without dairies, meat or fish. Our next stop was an old-fashion cafe called Krinos, where the decor hardly appeared to have changed since its founding in 1923. 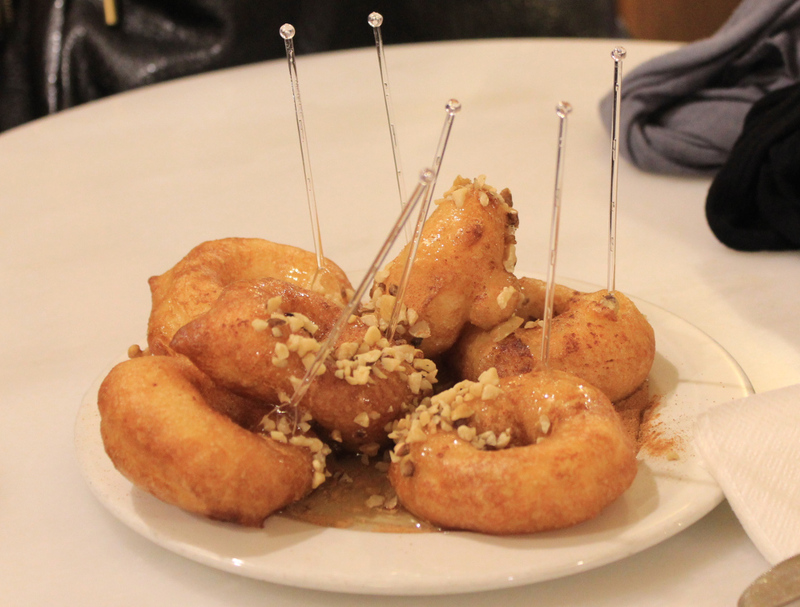 There we were served loukoumades, a donut-like pastry covered in honey and crushed nuts, often eaten at marriages and baptisms. It’s a sweet of Arabic origin and you can have it as a regular dessert as well. 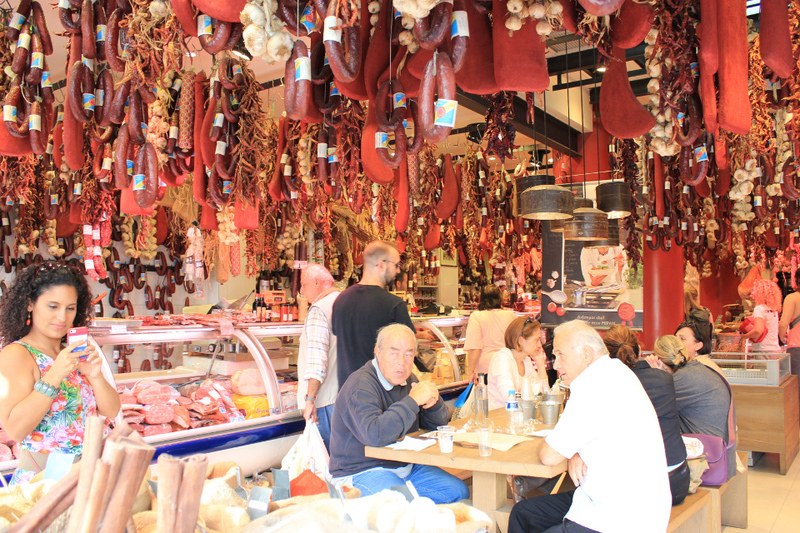 Our third stop was the Central Meat and Fish Market of Athens. The meat section sold every animal part imaginable, including an entire cow head! 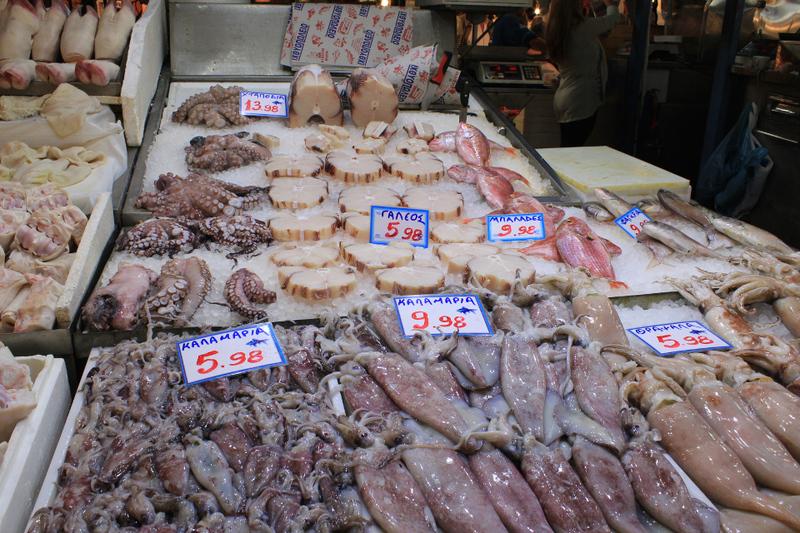 The fish section had slippery floors and enticing displays of calamari, squids, and several types of fish. Men screamed at the top of their lungs announcing the deals of the day. We stopped for over half-an-hour at the Lesvos Shop (named after the island of the same name). A table had been set up in the back for tastings and we all gathered around to try out samples of many different products including olive oils, feta cheese, honey, olive paste, sundried tomatoes, yoghurt, fruit preserves (glyco koutaliou), wine, and a dessert liquor called mastika, made from the drops of a tree found only on the south side of the island of Chios. I liked it. It was sweet and had a kind of herbal taste. We learned a lot at Lesvos Shop. For example, how do you know if honey is pure? Let it drip from a spoon. It should form a filament that doesn’t break. If the filament breaks, it means the honey has been mixed with other ingredients such as sugar. And did you know that Greece produces 42 kinds of olive oil (90% of which is extra virgin), and 120 kinds of cheese, making it the second producer of cheese after France? Neither did I before I took this tour! 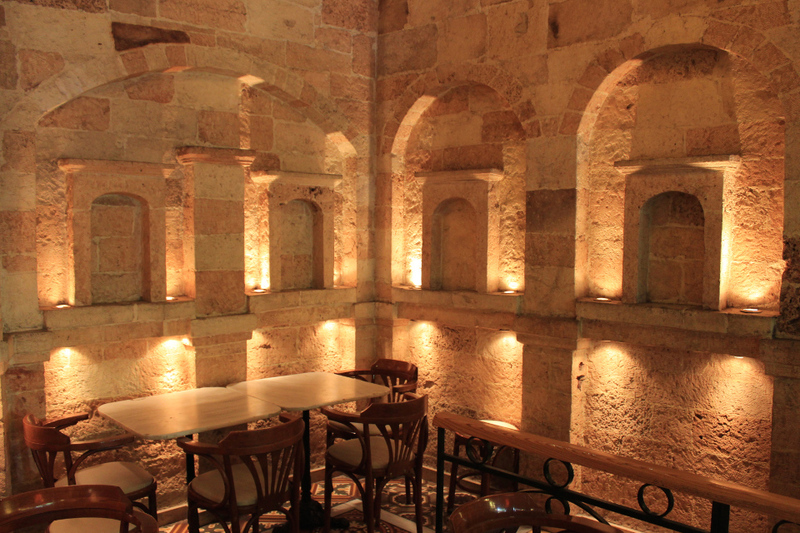 Next we stopped by Bougatsadiko, a traditional pie shop with a striking interior that makes you feel like you’ve entered an ancient monument. 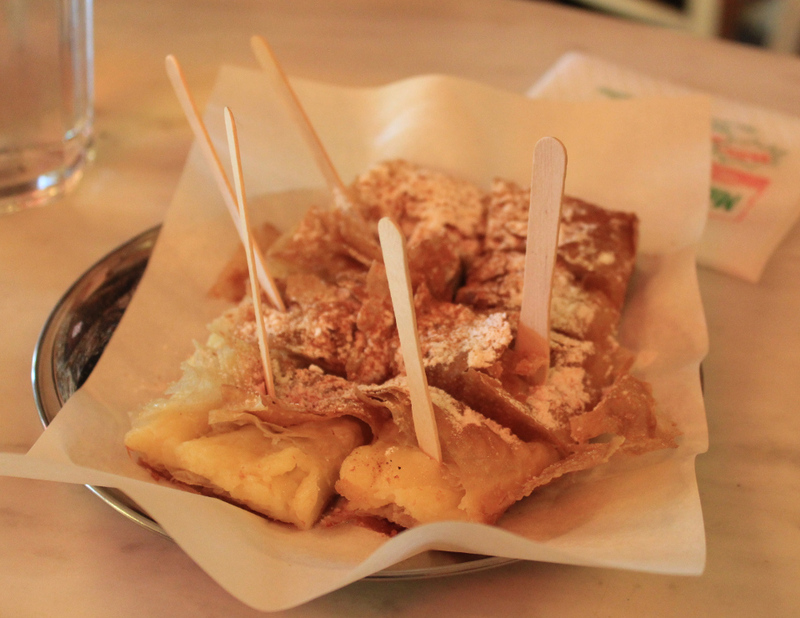 A bougatsa is a Greek pie made of layers of phyllo pastry filled with either custard, cheese, or meat. They are traditionally a breakfast pastry. By the way, “breakfast” in Greece is something you eat around 11:00 or noon (having had a coffee and koulouri earlier as a sort of “pre-breakfast” to get you going). 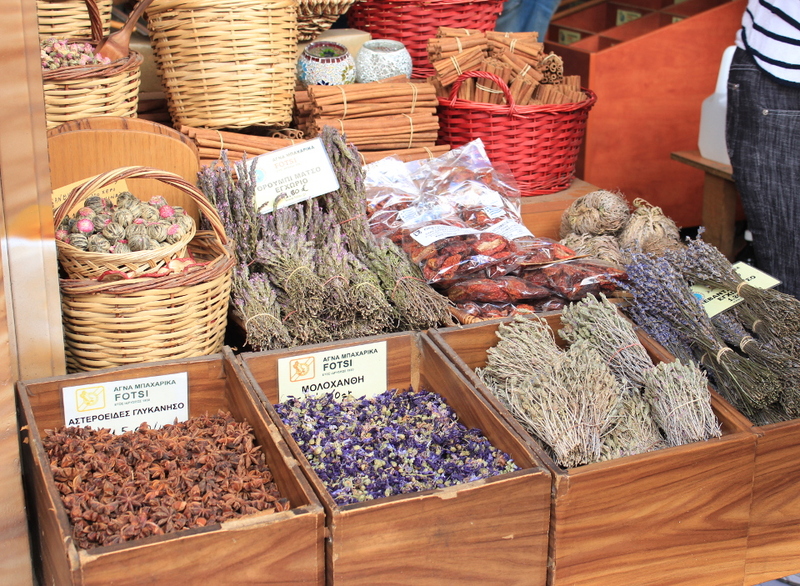 Following this we made a stop at an herb store called Fotsis where the smell of herbs, teas, and spices drifted all the way to the sidewalk. Just around the corner was Miran, an Armenian-owned delicatessen shop with sausages hanging from the ceiling like stalactites. 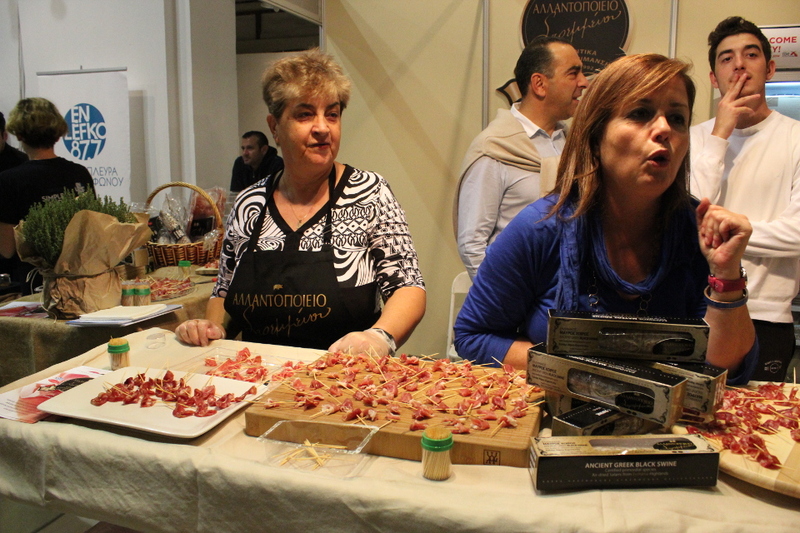 We got to try an expensive cured beef called pastourma, which was originally made from camel meat! 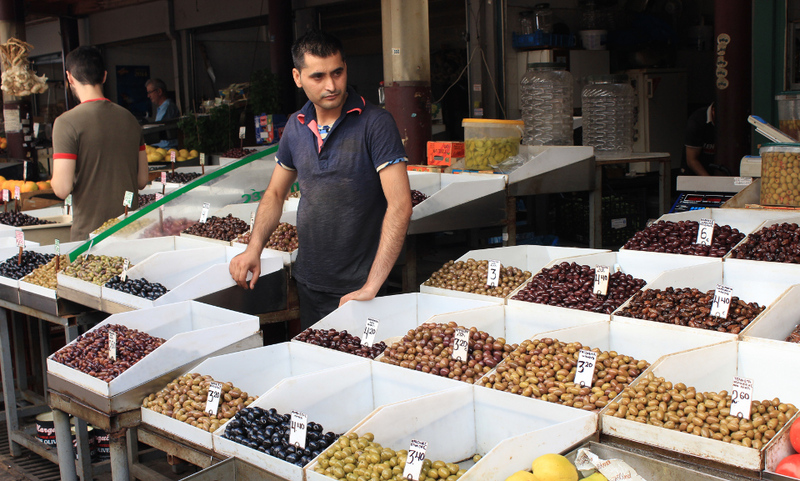 Rounding up the 3.5 hour tour, we strolled through the colourful outdoor Fruit and Vegetable Market offering several varieties of olives, in addition to chestnuts, pomegranate and more common fruits, veggies, and nuts. We were handed big red grapes and an addictive sweet called halva made from sesame paste, sugar, and almonds. 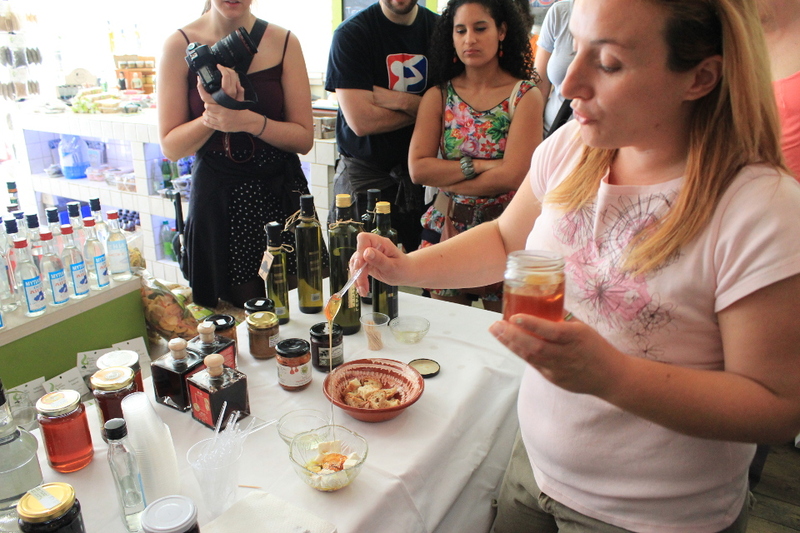 The bloggers’ conference itself provided many opportunities to try different Greek foods. 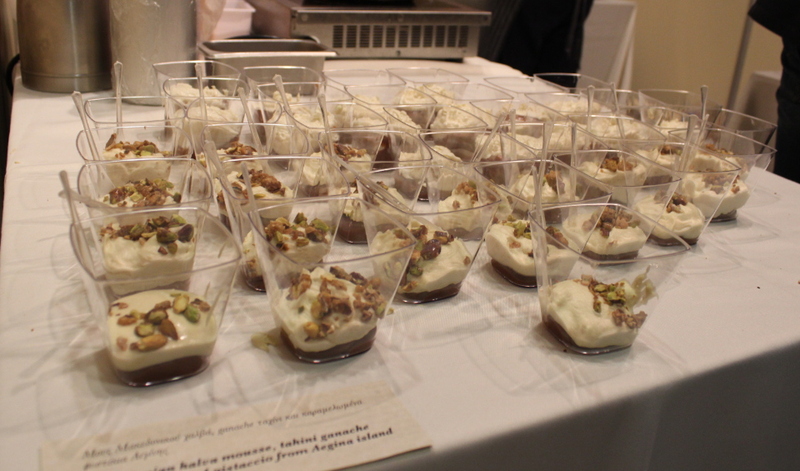 Not only were the lunches on both days catered and served buffet-style, but both the opening night and closing night parties revolved around food. The opening night party, was held at a venue called Technopolis. With a name like that, I expected some sleek and modern industrial-loft lounge, but what I walked into was more like a food fair. 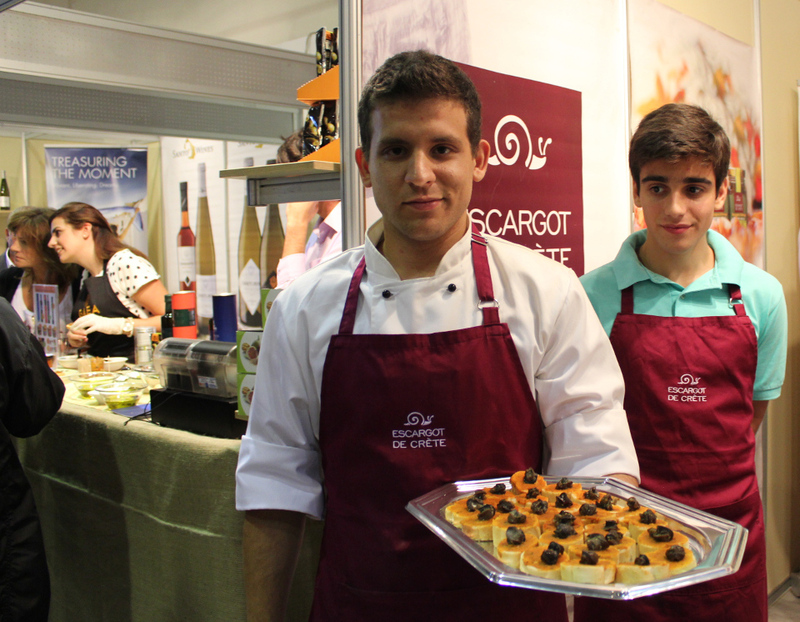 A couple dozens booths lined both sides of a well-lit building and offered food and wine samples: everything from organic cherry tomatoes to sophisticated appetizers from a downtown restaurant. 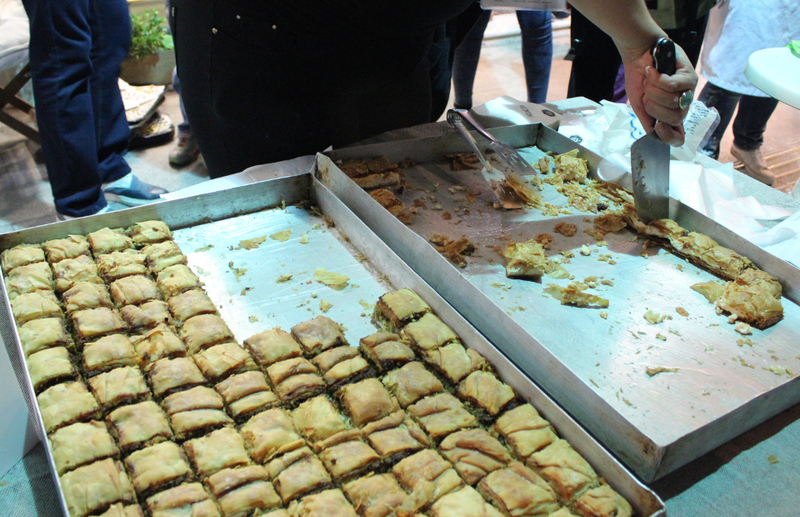 Within an hour or so, foods as varied as cheese pie, cured ham, pasta, cheese, snail, halva mousse, and loukoum (Turkish delight) had passed through my lips. Alpha beer had a booth outside the building pouring you as much beer as you wanted. The closing TBEX event was a stroll along Pandrossou Street where various merchants offered food and drink samples to everybody wearing the TBEX T-shirt. To be honest, I think there was more drink than food. I managed to sample some grilled meat with fried potatoes, meatballs, spinach pie, wine, grappa, and frozen yogurt. With all those organized events, I rarely needed to find my own food. 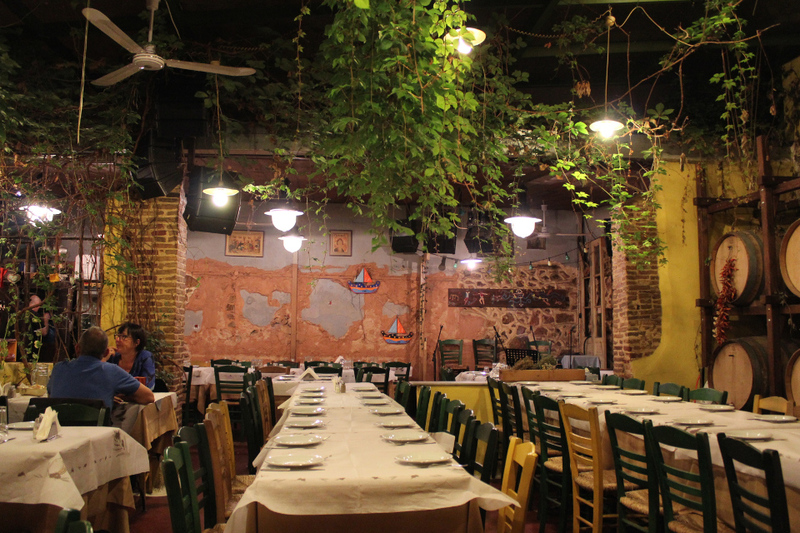 However, I went out on a few occasion, including a nice dinner at Taverna Klimataria, which had been recommended from Vicky of the food tour. 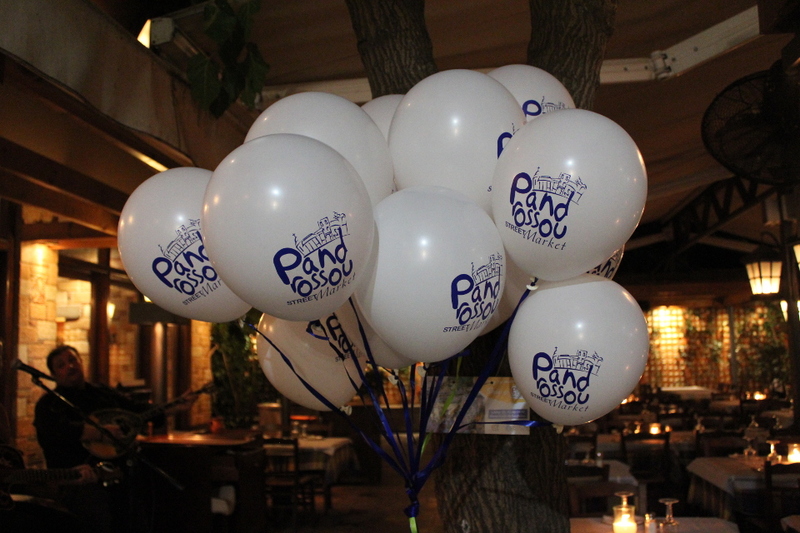 Although the place is a little hard to find and sits alone on a strangely deserted street (Theatrou Square), the atmosphere and staff were very pleasant and the prices very reasonable (no view of the Acropolis here). At 8:30 PM only a few tables were occupied (all tourists of course at this “early” hour – Greeks don’t normally have dinner until 10 PM). I chose karniyeri, a dish similar to moussaka but without the bechamel. The menu described it as a mosaic of potatoes, eggplant, zucchini, tomatoes, pepper, minced beef and yellow cheese. I washed it down with a glass of red wine. 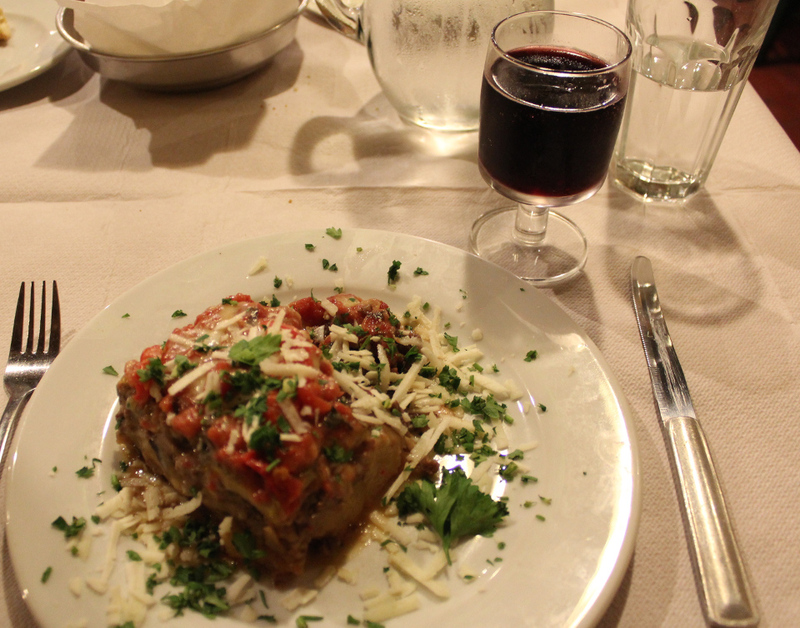 Greek-wine is not award-winning stuff but most of it is very drinkable, especially with food. By the way, I was told by several different guides that Greeks always eat mezes (small appetizers similar to the Spanish tapas) every time they drink so that they don’t get drunk. The idea is to socialize, not to become intoxicated! On another night, I went to a little corner restaurant/take-out place that I had noticed near my apartment. 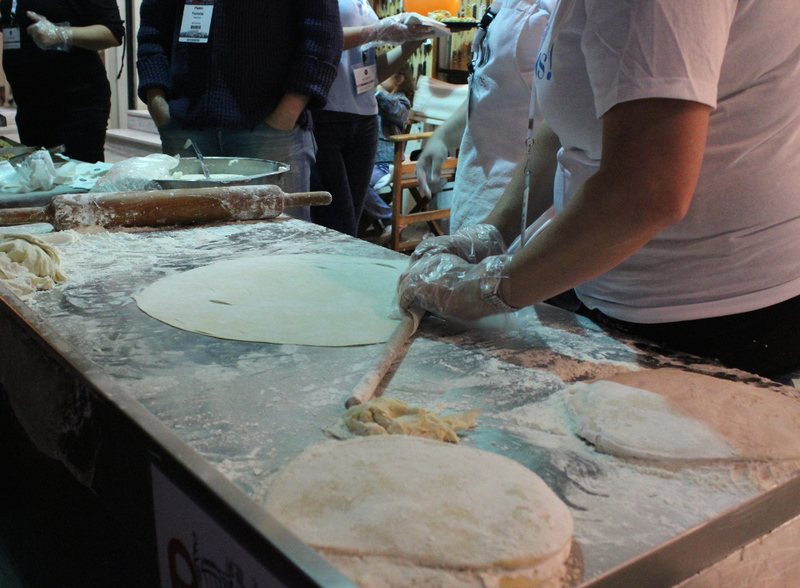 They serve gyros, the greek sandwich where meat is sliced from a vertical spit and placed in a pita bread. Although the menu was all in Greek, the guy spoke “a little English”. I had the pork gyros with “everything” which included not only tomatoes, onions and tzatziki, but also fried potatoes inside the sandwich itself. This big gyros, which was more than enough for a meal, cost me only 1.80 Euro! I hope you enjoy the photos. Everything I described here was sampled over a period of only four days. Bloody incredible! 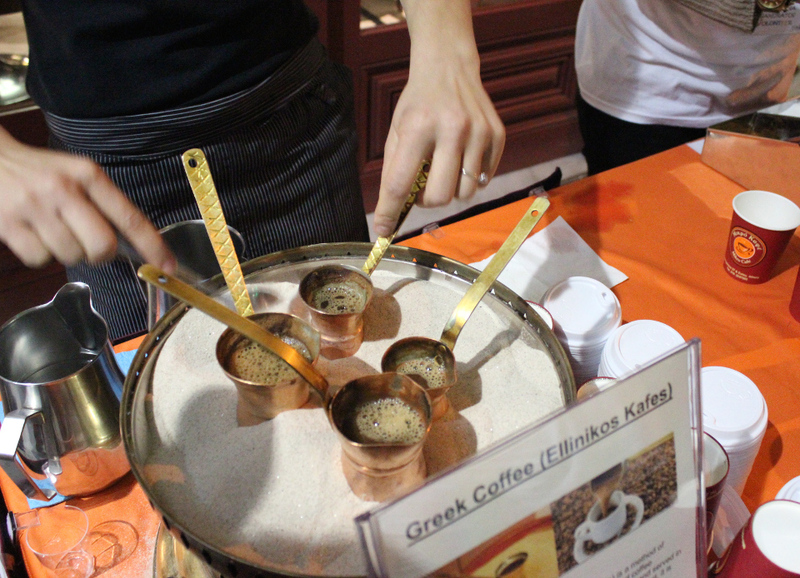 The Athens Food Tour was sponsored by Athens Walking Tours. However, all opinions are my own.